All About Bentley – An M.K. Clinton Post! Click to go to the Barking from the Bayou site! 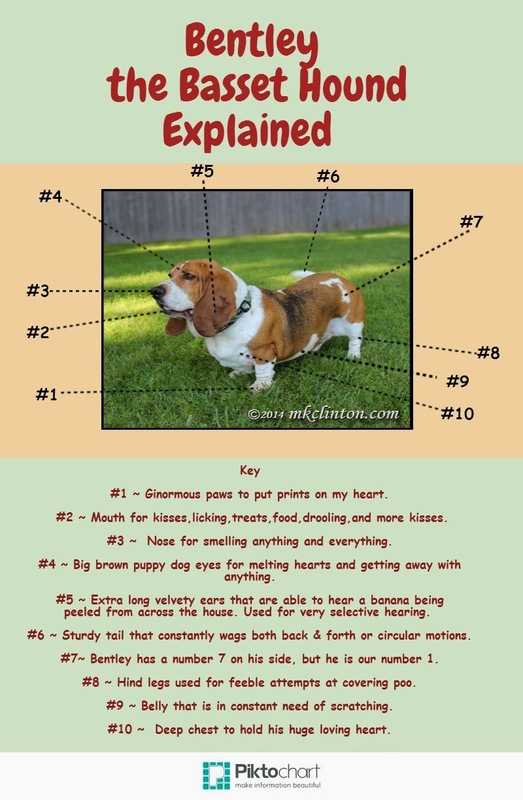 My friend Melissa posted the chart, Bentley the Basset Hound Explained on her site, Barking from the Bayou and I had to share it with you. If you haven’t read her books yet, why NOT?! Click on the book covers to order from Amazon, and let me know how you like them! And don’t forget to help feed a shelter pet today! Each answer to two simple trivia questions, one for dogs and one for cats, buys ten pieces of kibble for a homeless dog and a homeless cat! No animal should have to go hungry! Click the photo to go to Freekibble.com! He is so CUTE!!!!! Gotta love me some Bentley – and anyone who doesn’t get your books is missing out! He IS! Bentley and all his gang!